Dr Sophie Wynne-Jones discusses rewilding and food values in response to my film Ynys Enlli / Island in the Current / Isla en la Corriente 2. I am a human geographer, I work as a lecturer at Bangor University’s School of Natural Sciences, and have previously conducted research on rural policy for Government through the Wales Rural Observatory. My research over the last ten years or so has spanned a range of topics that broadly encompass questions of rural land use change – primarily focused on Wales, Welsh farming and conservation. As a social scientist I am interested to explore questions of land-use from the perspective of people, why they do what they do; why they understand the world in particular ways, and how differences in these experiences and knowledge-bases sometimes mean that people don’t agree. It is almost clichéd to say that we are living in interesting and in many ways distressing times, with Brexit yes but also with more wide reaching and longer term processes of both environmental and societal change. The way we use land (and the sea) has changed enormously, with the way we produce food, but perhaps even more so the way we consume and distribute it. Changes in the spatial organisation and sheer scale of our population have affected the demands we place on natural resources and the opportunities we have for connecting with the environment. We have become very detached and distant (both literally and psychologically) from the environment. The use and understanding of the rural landscape has changed hugely, affecting society as a whole as well as the people who live there. For the purposes of today’s discussion I want to take a closer look at some of these changes, exploring a few different aspects of my recent work, in a way that connects with the themes raised in your work Morag, and particularly what we have just seen in the film of Colin here. Firstly, I want to start with rewilding – as I know it was what brought you to my work at the outset Morag, and I know it is an area of concern and interest for most audiences. 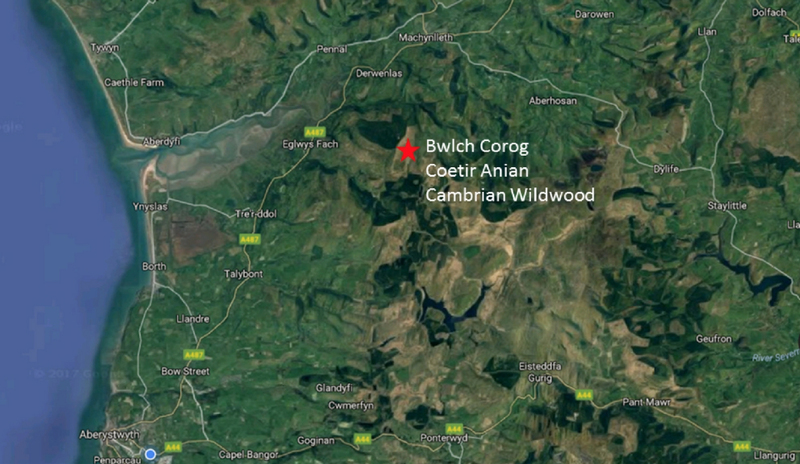 I have been working with the Cambrian Wildwood project in Mid Wales, just south of Machynlleth and a few valleys up from where I used to live in Tre Taliesin. This is a small but budding rewilding project that has been in the ideas phase for the last ten years, which came to fruition with the purchase of a 350 acres site above Glaspwll last year, after much hard work and the support of the Woodland Trust. I won’t go into details of the exact site, the proposals, and actions underway here. What I want to focus on is the challenges the project has faced and how these connect to different ways of knowing and understanding our environment. I’ll show you some quotes to illustrate this from interviews I have undertaken with those involved. What we can see here amongst advocates, is an aspiration to restore the landscape, to remediate and repair environmental harms. But this is not shared equally amongst the whole community, and rather than unpicking ecological ‘facts’ to determine who is wrong or right, I have found it more productive to try and understand the different values and cultural norms that underpin why different stakeholders have particular aspirations. Trustees / supporters talk about a damaged land to be improved and replenished by rewilding; Monbiot has used the term ‘ecological boredom’ to describe his reaction to the landscape and lack of wildlife in the area; whilst there is also a romanticism attachment to notions of the wild and a need to ‘get back to nature’ as something healing and pure prior to human corruption. So the very language and imaginative possibilities for knowing the land in Wales is bound up with cultural practice, husbandry and pastoralism. This is as much about bodily and habituated ways of knowing as socialized ways of thinking. The artist Ffion Jones, whose parents farm at Cwmyrhaiadr over the hill from the Cambrian Wildwood site, has explained this to me in terms of the differences one might experience in physically looking at a landscape – whether one sees the picture tirllun implies, enjoying the view as you might if you are more practiced in walking or painting for leisure, or, whether one is engrained in the practice of checking for stock – Is that boulder a dead lamb? – so your eyes don’t ever travel to the horizon beyond. From this, I see that the tensions with rewilding are about more than a change in land-use practice in specific locations, and arise instead from the broader threat this poses to constitutive values. I think this connects with the difficulties that Colin articulates in the film, around conservationists coming to Bardsey not trying to engage with ‘yr hen bobl’ and their ways, but also that his basis for knowing the island and his skills were learnt ‘trwy wneud’. What we are talking about, then, is not simply about optimizing land/resource-use and trading off some losses or gains, but questioning the validity of (or simply ignoring the existence of) a whole value system and way of being. This isn’t because conservationists / environmentalists are bad people, but because we – as a society - have not always been very good at listening, never mind developing empathy, by seeking to understand other ways of knowing the world beyond our own. And the way we are taught science often compounds this, western science doesn’t allow a lot of room for other ways of knowing the world to coexist; it tends to demarcate everything else as wrong, or unscientific, irrational. This question of scientific v’s practical (or expert v’s lay) knowledge is something I am particularly interested in and one of my PhD students Siobhan Maderson is doing some really exciting work, looking at beekeepers’ environmental knowledges and the distinctive ways of knowing, seeing and being in/with the world that come from this somewhat unique husbandry practise. In particular, her work has considered the problems beekeepers have in getting policy makers and scientists to engage with their insights in equal terms. Whilst beekeepers often have very rich insights into habitat change or weather patterns in particular areas, their knowledge is often not seen to be valid in the same ways that data derived from an experiment would. This is both a question of expertise and hierarchy but also the norms around what is deemed to count as appropriate knowledge – and the trouble with this is that is creates blind spots. Science is not able to count, or attend to everything – and the things it struggles to account for, and measure or model, are then ignored and removed from action plans / governance frameworks. I have seen this similarly with farmers working with scientists on flood reduction schemes, or habitat improvements for wildlife, where the farmers’ detailed knowledge of their land is not taken into account until some way into the project… although thankfully now these trends seem to have halted and more recent schemes I have seen are working much more equally with farmers, or even starting from their impetus and goals – which is pretty critical when you are talking about trying to work with land managers to make things happen over the longer term – if something, a scientific insight makes no sense or has no purchase with local stakeholders you are not going to get very far in changing practise, or engaging people in the need for change. Across all these cases, it is not that one perspective is right or better, but rather that we need a dialogue and better appreciation of the reasons people have different ways of knowing, so we can both respect and learn from each other. It is important to stress that this is not simply the case of deferring to farmers’ (or beekeepers’ or lay community) knowledges or valorising them as the original/indigenous people, those with the most authentic/valid connect to the land, and portraying conservationists as outsiders. Here I take issue a bit with the simple divisions that we see in the film. I think any tendency towards ethnic and xenophobic lines of attack is dangerous and creates a line of argument that compounds tensions – as I have seen with the Cambrain Wildwood. In Wales we are particularly guilty of returning to this way of thinking. My friend and colleague at Prifysgol Aberystwyth, Rhys Dafydd Jones, has discussed citizenship as a primarily ethnic rather than civic quality in Wales, despite huge efforts to broaden the basis of Welsh identity in the post-Millennial era. Somewhere like Enlli we see clearly the need to take a different approach. It is a meeting of world and currents, of new technologies, trade routes and pioneers. Origin is not a marker of belonging and worth, but perhaps rolling your sleeves up and encountering the people and the cymdogion gwyllt in a genuine and open way is a good start? To close, I want to raise one final point, which takes us in a slightly different direction, but connects again to the film of Colin and the points he makes about the need for a functioning economy to allow the community to thrive. I have worked a lot on the question of economic priority and particularly whether farmers enter into environmental schemes for financial gain as their primary rationale. Politicians are sometimes guilty of assuming they can simply throw money at farms and they will do whatever the money is telling them to do. My research suggests a more complex picture, where economic imperatives are important, but need to be considered in the round with a range of deeper-seated values and long-term strategies for the farm. In the film Colin refers to the economy repeatedly as a force for good, and I wanted to clarify or question some aspects – the type of economy he is pointing to is not that of rampant consumerism, and growth pursued for its own sake, as we have now, but economy as a means of managing resources and gaining reward to enable connection to other resources. Not aiming for money above all else, but money to maintain livelihoods, to support wider objectives and value for the land, family and community. I have seen this expressed elsewhere by farmers and just wanted to close with this now as something we need to consider in the development of new land management/environmental schemes into the future. How might we best speak with farmers and design schemes, which support this? But also to think quite fundamentally about why we have a divided sense of conservation separate from ‘productive’ outputs – is conservation forever trapped as a figure of modernity, i.e. there wouldn’t be a need for conservation if we didn’t have such a divisive way of producing food and meeting our resource needs?